The Florida Environmental Health Association, Inc. (an affiliate of the National Environmental Health Association, Inc.) is a non-profit group of over 700 professionals interested in protecting and promoting the health and safety of Florida's residents and visitors. FEHA was organized on October 12, 1947 in Tampa, Florida and incorporated on July 12, 1967. 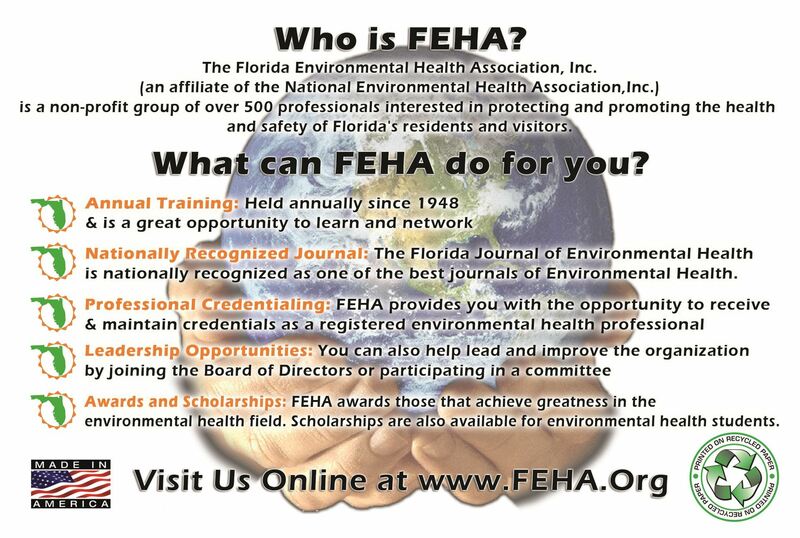 By joining FEHA as an individual or as an organizational member, you not only support the Association's goals, you receive a free subscription to the Florida Journal of Environmental Health, FEHA's official publication. The journal tells you what is happening in the field of environmental health in Florida, as well as keeps you up-to-date with Association news. "To enhance the professional integrity, knowledge, and working conditions of the environmental health professional, as well as to promote the social and economic conditions of its members." This mission will be achieved by maintaining standards of conduct, providing a certification process that includes educational standards and professional development, applying and promoting scientific principles, communicating with the membership and districts, and promoting the profession through publications, training, and liaisons with other associations. What does FEHA have to offer you? The Florida Journal of Environmental Health is nationally recognized as one of the best journals of Environmental Health. Your membership includes a subscription to this publication. FEHA awards those that achieve greatness in the environmental health field. Scholarships are also given to those pursuing environmental health degrees. FEHA's bylaws are the governing documents of the organization.